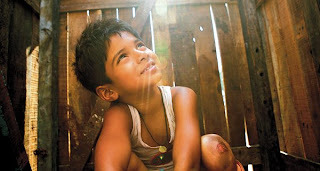 "What can a slumdog possibly know?" --"The answers." So as soon as I got another movie in the mail from Netflix, my roommate invited me to see Slumdog Millionaire with her this afternoon. I have to admit, i was a bit hesitant about it, but it was one of the few Oscar films I didn't see this year, so I said why not catch the $6.50 matinee? My hesitance comes mainly from all the commercials and trailers I see about the movie which basically tells me that some kid from Mumbai, India becomes a millionaire form a show and somehow brings him closer to his one and only. I just didn't want to be in for a let down. But I was told there is more to it than just that. I was going to be the judge of that. So I went into the theater and braced myself. What I saw was a story about two brothers who weren't raised poor, parentless and alone in Mumbai, but one of them were destined to be with his beloved, and the other was not destined to be at all. They meet a young girl named Latika who the younger one, Jamal, falls in love with, but loses her through circumstances and politics in India. Jamal, goes on the Indian version of the game show "Who Wants to be a Millionaire" in order to reach the love of his life he once lost, who once said "people who go on this show open up the door to another life." So yes, the movie touches on young love, perseverance, triumph and loss. But what I really got from it was overcoming; overcoming what life has given you, and overcoming the odds against you. Sidebar: Frieda Pinto (who plays Jamal's love interest) is soooo stunning in this movie. She's gorgeous! And the little boys who play the characters in the various stage sin their lives are just so endearing and adorable. You really get an inside look at life in Mumbai, aside from all the tourist attractions. You see how people, young and old, are really living and you get a first hand look at how some people rise above their assumed destiny, and claim their own. Another one that I absolutely enjoyed. Different from what I'd normally see, but well worth it.